Mariekirche, or the Old St. Mary’s church is one of old Fredericksburg’s landmarks. When the building next door was built in 1906, the original church was remodeled to be a parochial school. When the new school building was built across the street, the old church fell empty once again. For several years, restoration funds were collected through Wild Game Dinners and Damenfests. 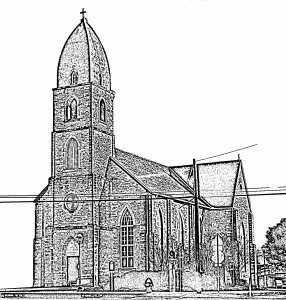 St. Mary’s history goes back almost to the city’s founding. The Catholics, who were among the first settlers, worshipped in the Vereins Kirche, and in the home of John Leyendecker, a schoolteacher. In 1847, Fr. Dubois, a Frenchman who later became bishop of Galveston, and Fr. Salazar, a Spaniard, arrived here to hold mass, the first Holy Mass in Fredericksburg. Although they were only here for two weeks, the local Catholics were inspired to build their own church. The original townlot was granted to Gerhard Rehmann, who, in 1854, conveyed the lot to members of the Roman Catholic Church for $18 cash. Included in the conveyance were the lots where the St. Mary’s Elementary School now stands. For many years this was where the St. Mary’s rectory stood. In the summer of 1849, Fr. Menzel, a native of what is now Czechoslovakia, arrived as minister. Since the church had not been finished, services were held in the Rectory. When he returned to his homeland and year and a half later, he had left behind a large wooden cross to replace the ones left by Spanish missionaries. In 1853, Bishop Odin of Galveston, who was later transferred to New Orleans, administered the first sacrament of confirmation in the city. In 1859, a popular Jesuit priest, Fr. Weinninger, spent three weeks here. A popular missionary of the day, the parishioners pleaded for him to return. He asked that a church be built as a condition of his return. Work on the Marienkirche started in 1860 and was finished during the early days of the Civil War. The Church’s most distinctive feature is its stone spire, a strong reflection of the homeland Gothic. It has recently been restored. “New” St. Mary’s supplanted the Marienkirche in 1906, more finely detailed and delicate in appearance but equally Gothic, and is one of Texas famed Painted Churches.